March - This seems to be a month of technical failures. So far the Audi has an electrical problem with the dashpod, the Netgear wifi router has failed after two months and the Philips DVD/VCR recorder has packed up for the second time in its twelve month life. The electrical goods were both gifts from Amazon.co.uk and the hassle to get them sent back and replaced is an absolute nightmare when both of us are working long hours. Jane had to work a full week because there has been a lot of illness at the surgery, this work is tougher physically than her previous job at the Council. Steve is working his usual 08:15 - 18:00 with a twenty minute break for lunch. Parcelforce must be one of the worst commercial organisations in Britain. They are almost impossible to get hold of either by phone or on the internet. They refuse to work on Saturdays, will not give a time for a collection other than sometime between 09:00 - 16:30. Internet shopping is fine, its the delivery service that needs to be completely overhauled - these guys should be taken to the cleaners. If you've had a similar experience and wish to make a comment on their service please click here. Eventually the parcel was collected from work but only after a lot of heartache. We now wait for Amazon to send us notification of the gift certificate we should receive and then we will think about purchasing a PVR (personal video recorder) which has a DVD RW and a Hard Disk. Our friends Martin & Kate recommend it as the best TV recording solution. We managed to fit in a few walks during the month, usually heading out from home and crossing the fields to walk up to Gayton or along the canal. There were occasions when the wind was icy cold but we forced ourselves out. We always enjoyed the cup of tea and crumpets when we got home. A very cold spell during March has meant that all the spring flowers are very late in coming out. 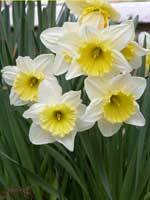 The last week of the month was wet, windy and mild which gave an opportunity for the daffodils to come into flower. The grass has started to grow so it won't be too long before the lawnmower will have to come out of hibernation and we can think about tidying up the flower beds, preparing the vegetable plot and making ready for summer. 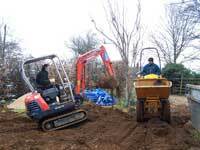 We visited Nick & Val one weekend when Nick had hired a mini digger and dumper truck. Nick is an expert at using the digger because of his past experience but we couldn't resist having a go on the dumper. It steered by pivoting around the centre just in front of you and it also twisted around the central point so it felt really unsafe when going down an uneven bump. We both had great fun and we may have even helped out a little bit whilst Nick was digging out the front drive in readiness for laying paviors. Still more work to be done there so we might have the chance again to help. Thankfully Val took pictures of us to give you some idea of what fun can be had when there are no gears, no brake and the steering is just weird. The Green Wing has returned. It is one of the most creative comedies on TV at the moment and it's surrealism is incredible. The action is slowed down and speeded up sometimes at random which in itself adds to the whole experience. We've been watching the reruns but unfortunately they start just after 23:00 and run on until after midnight which means we feel like death in the morning - still, it's worth it.